Kota is one of the significant and most populous cities in Rajasthan and is also a famous tourist spot in the state. If you are looking for a place where you can enjoy the beauty of nature amid modern settlements, then Kota is one of the few places in India which will certainly interest you. From lakes to gardens and beautiful palaces to alluring parks, there are innumerable places of interest within the boundaries of Kota. Once a princely state, Kota is also popular as the educational hub of India, due to presence of several coaching classes, and the industrial city of Rajasthan, as it is home to numerous industrial plants. Hence, it is one of the fastest-growing cities in India. Plan a trip from Bhopal to Kota now to learn in detail about this interesting city. With a semi arid climate, Kota experiences hot summers. However, due to the presence of natural beauties within its boundaries in the form of gardens, lakes and rivers, the weather is bearable throughout the year. If you are looking to avoid the summer heat of Kota, then the best time to visit here is from October until the end of February. By Air: You can take a direct flight to Jaipur Airport, which is situated about 240 km from Kota. Once you are at the airport, you can hire a taxi to Kota. By Rail: There are direct trains available between Kota and Bhopal. Hence, you can catch a train from Bhopal railway station to Kota Junction. By Road: Located at about 350 km from Bhopal, Kota is well connected to all other cities and towns by road. Route 1 is the fastest and it will take an approximate time of 7 hours to reach your destination. Hence, it is a preferable route while heading towards Kota from Bhopal. On your way, you can explore the beauty of Narsinghgarh. Narsinghgarh is an ancient settlement in the Rajgarh district of Madhya Pradesh and is believed to have been founded during the 17th century. It is popular amongst locals and passers-by for Narsinghgarh Fort, which was the official residence of the Narsinghgarh rulers. Even though the fort is in a dilapidated condition, it is still visited by several curious tourists. Apart from the fort, you can also visit Bada Mahadev Mandir, Nadiya Pani and Badi Hanuman Gadi. Narsinghgarh is situated 80 km from Bhopal and 300 km from Kota. Once you are within the confinements of Kota, you will be subjected to savour the grandeur of its ancient buildings and natural marvels. Flourishing beautifully on the banks of the Chambal river, the surroundings of Kota offers its visitors a peaceful and composed environment. Following are the places which you shouldn't miss visiting while in and around Kota. 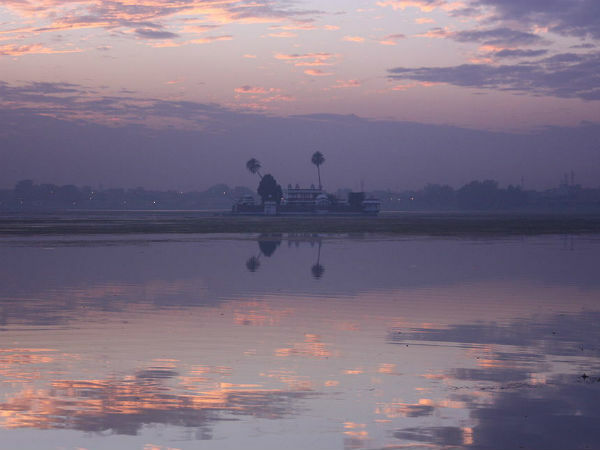 Chambal Garden is a perfect spot in Kota to spend your mornings and evenings. Beautifully maintained and well groomed, this mesmerising garden is covered with lush grass and colourful trees. If you are looking for a calm and vibrant atmosphere in Kota, then you need to visit Chambal Garden. Seven Wonders Park is one of the most visited spots in Kota. As it is clear by the name, it houses all the seven wonders of the world within its boundaries. So, how about witnessing the beauty of the mini versions of these wonders at this park? The most beautiful and scenic stoppage in Kota, Kishore Sagar Lake is a beauty which resembles heaven at the time of dawn and dusk, when sunrays reflect over its sparkling and still water, thereby, giving its surroundings a brilliant look. Wouldn't you love to be there and witness such an amazing phenomenon of nature? Another beauty which you shouldn't forget to catch a glimpse of, Jagmandir Palace is the splendour of Kota. Surrounded by a beautiful lake, it never fails to astonish the visitors with its magnificent and majestic looks. The spectacular reflection of the palace in the water definitely looks surreal and seems like a heavenly beauty. If you are not tired of visiting its prominent places and are looking for more spots, then you can also explore Umed Bhawan Palace, Char Bagh, Abheda Mahal, Godavari Dham Temple, Garh Palace, Kota Government Museum, Chatra Vilas Garden and Kota Zoological Park. If you think Kota is a beautiful destination and a perfect weekend getaway from Bhopal, then you must get busy planning a journey to this remarkable beauty.